So, it’s lunchtime, and you happen to be in an office on Etna Road in the backwaters of Hanover. You’re hungry, but you didn’t bring a lunch, and you really don’t want to drive all the way into Hanover or Lebanon just to grab something to eat. So where do you go? 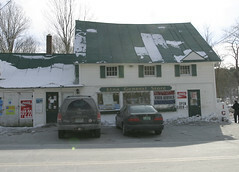 The Etna General Store, in “Metropolitan Downtown Etna”. I have a bit of fondness for the Etna Store, since it’s your basic General Store, with food (a bit more than your typical gas station or convenience store), video rental, animal feed, and a few other random items like lottery tickets, all in a, umm, distinguished building. They also have a fairly predictable schedule of lunch specials, so, if you like a particular item (like the sausage grinder, every other Friday), they’ll usually have it if you go on the right day. 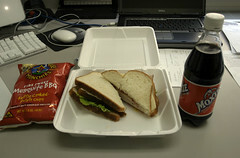 This week, I had a turkey club sandwich (at right), while grabbing some Madhouse Munchies and a Moxie. While I really prefer my sandwiches on toast (the Maillard reaction really is a wonderful thing, especially in a sandwich), it was actually a pretty good club sandwich. And, like many of the places I’ve reviewed for Takeout Tuesday, this place wins the Contractor Seal of Approval[tm] (lots of the local contractors and painters like to get lunch there). 1. To be honest, I mostly go for the location, since this is the only place I get go to get food and get back to my office in under 10 minutes. 2. I have a weakness for good hot dogs, and the steamer at the Etna Store is allows chock full of McKenzie of Vermont hot dogs. 4. Character. This place oozes local character almost as much and Dan and Whits (and, like the D+W’s, it also attracts a lot of thru-hikers in the summer). 1. It can be a bit uneven. While in general I rather like most of the lunch specials, a few of them really don’t do it for me (the chicken burger and the the tuna casserole, for example), and aside from the specials and subs, that’s pretty much the selection. Similarly, some of the specials are a really good deal, while others seem pricey for what you get. In any case, if you are in Etna or the Etna Road part of Lebanon, this isn’t a bad option for a quick lunch. the breakfast special of an egg sandwich with bacon or sausage and a coffe for 3 dollars is the best deal in town by far. There are a lot of New England traditions I really enjoy this time of year. Snowshoeing. Winter Carnivals. Maple Sugaring. And community suppers. Almost every weekend in late winter, harvest, and game season, there are a wide variety of community breakfasts and dinners, sponsored by a wide variety of local organization, churches, fire departments, and clubs, all of which provide a good way to meet a good cross-section of local society, as well as have a good hearty meal. While there are many such local dinners, however, quality really can run the gamut from “cheap spaghetti dinner” up to “homemade top-notch feast”. And the Hartland Congregational Church (known locally as “The Brick Church” to distinguish it from the white painted church down the road) hosts a top-notch example of the later: the Hartland “Famous” Roast Beef Supper.